Imagine standing at the foot of the great pyramids of Giza, enveloped in a warm desert breeze, taking in the spectacle of lights, sound and narration that celebrates the mystery of these ancient structures. Some of the music you would hear is by Halim El-Dabh, Egypt’s most important living composer. His work has been played nightly at the pyramids since 1961. But you could have heard—and still can—much of the music of Halim El-Dabh without setting foot outside northeast Ohio, which the Cairo-born composer has called home for three-and-a-half decades. From 1969 through 1991 he was a member of the faculty of Kent State University and, since 1979, co-director of Kent State Center for the Study of World Music. El-Dabh’s compositions have been performed at the Metropolitan Opera House in New York City, the Cairo Opera House and the Edinburgh Festival, as well as in Amsterdam, Athens, Paris, London and Rome—and in concert halls and churches throughout northeast Ohio. His prodigious output includes 11 operas, four symphonies, numerous ballets, concertos and orchestral pieces, incidental music for plays, chamber and electronic works. El-Dabh was asked to provide special music for the long-awaited opening in March 2002 of the reconstructed Library of Alexandria, the ancient world’s greatest repository of knowledge. The celebration, attended by Egyptian dignitaries and V.I.P. guests from around the world, featured a concert of his electronic and electro-acoustic works and three concerts of his orchestral chamber music in collaboration with the Bibliotheca Alexandrina String Orchestra. 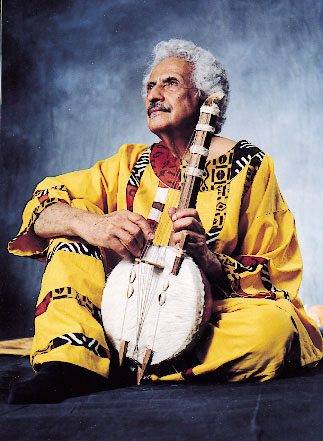 In 2006, his 85th birthday was commemorated with numerous performances of his music throughout the United States, Egypt and Europe. Halim Messieh El-Dabh uttered his first (decidedly unmusical) sounds in March 1921, to the fierce percussion of a raging thunderstorm. Youngest of the nine children of an affluent Cairo family, he soon found himself battling his older brothers and sisters for time at the old upright piano. In 1932, 11-year-old Halim, whose unusual gifts had long been apparent, attended the Congrès du Caire, an international music conference organized by King Fuad, where he met composers Paul Hindemith and Béla Bartók, two men whose interest in creative ethnomusicology El-Dabh would come to share. By the 1940s, a student at the Szulc Conservatory, then Cairo University (class of 1945), El-Dabh was winning piano competitions at the Cairo Opera House. In the early 1950s, his first Fulbright award brought him to the United States, where he studied with some of the giants of 20th-century composition and conducting, including Leopold Stokowski, Irving Fine, Luigi Dallapiccola, Leonard Bernstein and Aaron Copland, earning degrees from the New England Conservatory of Music (1953) and Brandeis University (1954), and later with electronic music pioneers Otto Luening and Vladimir Ussachevsky at the Columbia-Princeton Electronic Music Center. In 1958, El-Dabh was commissioned by choreographer and modern dance pioneer Martha Graham to write the music for her masterpiece, Clytemnestra (1958). “For once a composer has no end in view for his music beyond making it an inseparable element in a theatrical collaboration,” said The New York Times. “Sometimes [the chorus of two, a man and a woman dressed in impeccable modern evening clothes] resort to wordless chanting with almost Kabuki vocal colorization. . . . Elsewhere the orchestra groans and shrieks and mutters and throbs, in timbres as odd as that of the movement on stage. . . .” The composer collaborated with Graham on three more ballets, A Look at Lightning, One More Gaudy Night and, in 1975, Lucifer, starring Rudolph Nureyev and Dame Margot Fonteyn. In 1987 El-Dabh was commissioned by the Memphis Symphony Orchestra to compose a work for the city’s celebration of the sister cities of Memphis, Egypt, and Memphis, Tennessee. Ramesses the Great: Symphony No. 9 for large orchestra was the result. (The score is subtitled Symphony No. 9, not because El-Dabh had composed eight previous symphonies but because it makes reference to the Ennead, the nine religious forces that dominated the daily lives of ancient Egyptians.) In 2006, at the age of 85, he was again bridging different cultures and musical traditions with a fully realized operatic version of Thamos, King of Egypt, which juxtaposed the stirring choral numbers and interludes composed by the young Mozart for the original play with his own Egyptian sonorities. A well known figure on the international music scene, El-Dabh held faculty positions at Haile Selassie I University in Addis Ababa, Ethiopia (1962–64), and Howard University, Washington, D.C (1966–69), before coming to KSU, where he received the Distinguished Teaching Award in 1988. The following year he was appointed University Professor, Kent State University’s highest faculty honor. Named Professor Emeritus upon his retirement in 1991, El-Dabh still teaches in Kent State University’s Department of Pan-African Studies. His many other awards and honors include two Rockefeller fellowships (1961, 2001), two Fulbrights (1950, 1967), two Guggenheim fellowships (1959–60, 1961–62) and the 1990 Cleveland Arts Prize. In May 2001, El-Dabh received an honorary doctorate from Kent State University, and another in May 2007, from the New England Conservatory. His music is published by C. F. Peters.